When most people think of concrete, the simply think of simple grey coloring on countless sidewalks and driveways. This simply couldn't be further from the truth. In fact, if you don't know what a beautiful surface, interior or exterior, is made of....it was probably made from stained concrete. 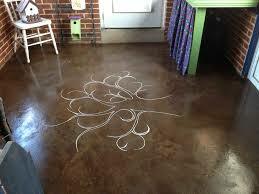 Modern treatments can make cement almost any color of the rainbow and even very elaborate designs. Hearing promises like that may make you think that is must also be expensive. This also isn't true. Depending on how elaborate of a design you are looking to install, stained concrete often costs less or as much as tile on a per square foot basis. When you factor in the reduced cost of maintenance and longevity of concrete, it is simply the best value for you home surface dollar. Acid based stains actually permanently chemically merge with the concrete. Because not every inch merges in the same way, acid staining can create a very natural non-patterned appearance. That can be a blessing and a curse. You should not use acids if you are looking for consistent, predictable color. 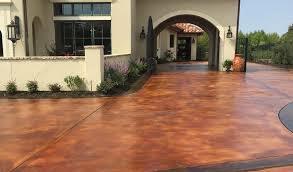 Water based stains simply fill in the pores of the concrete and more like painting any other material. If you are very sensitive to chemicals, water based may also be the preferred method. Also, if you're more risk averse and want to be willing to change your mind later. Staining is pretty permanent, but can still only last as long as the surface of the concrete does. Applying sealer and/or floor wax will help preserve your floors and counters for a long long time. Fading should not be a concern for the average homeowner.